Real estate shifts are the natural ebb and flow of the market. The real estate market never stays constant. It is affected by supply and demand, employment, the economy, interest rates, weather, political forces, and more. Our world is in a constant state of shift, so why would the real estate market be any different? We’ll show you why the SW Florida real estate shift is real and it is in effect. Nobody would expect the stock market to stay the same each day. People know that it goes up and down, and many times it does so in the same day. Currently the SW Florida real estate shift is on. 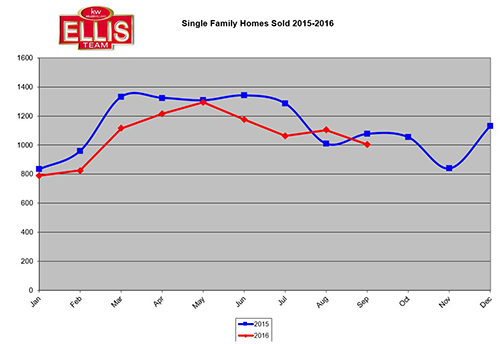 Last week we reported that sales prices have been flat all year. Some prices ranges have gone up and some have gone down, and overall the market is flat. If you didn’t read last week’s article on about SW Florida home sellers we’d encourage you to go back and read it as the graphs show perfectly what is going on with prices. Today we’d like to focus on closed sales. As you can see from the chart, closed sales are down in Lee County versus last year. In fact, they’re down 9.04% year over year. We have rising inventory, declining sales, and stagnant home prices. I’d call that a shift. It’s nothing to worry about or blatant in the numbers, but something to be aware of going forward. In a shifting market, marketing is more important than ever. To get top dollar your home must compete and stand out. It must do so in three ways. Everyone knows if they wish to sell something it pays to have interest from more than just one party. Imagine selling an item online. Would you rather have 1,000 bidders or just 1 bidder for your item? Of course, everyone would choose multiple bidders when selling. The same is true in real estate. You don’t necessarily need multiple bidders; however, you better expose the home to multiple parties. Everyone would agree that 100% exposure equals top dollar. Anything less may net you less than top dollar. Secondly, while marketing is most important, no amount of marketing will sell an overpriced home. We could spend a million dollars marketing a property. If it is worth $500,000 and we price it at $1 million will it sell? Of course not. Thirdly, the agent you choose may be the most important factor of all. You want an agent that will give your home the most exposure. You want an agent with experience to know what price it should start at, and the wisdom and courage to tell you when it’s time to adjust. Inexperienced agents may not know how to price, and they may not have the courage or confidence to tell you an adjustment is needed. When I go to the doctor because I fear something is wrong I don’t want a doctor who will tell me what I want to hear. Of course, I hope its good news and nothing to worry about. However, if it isn’t I want a doctor to tell me straight-up so I can make quick decisions and rectify the bad situation. The sooner you deal with a medical issue the less pain you may feel on the back end. In life, the sooner you deal with issues the quicker they are resolved and the sooner you get back to living life. The same is true in real estate. When making a real estate move, don’t call that friend who just got their license or that family member who needs help. You want the best, and your financial success depends on it. Especially in a shifting market. When financial markets shift, you’ll hear the term “Flight to quality.” This means a movement towards safety and dependability. In real estate, sellers move towards experienced agents who can guide them through the shifting maze. Now is when experience counts, and your future depends on the advice, expertise, and marketing from agents who can guide you. If you go on a swamp buggy tour, you’ll know what I mean. You want a tour guide who’s done this a time or two and won’t tip the buggy over in alligator infested swamp water. We’ve done this a time or two, so feel free to call us if you’d like to buy or sell in SW Florida. Visit our website at www.LeeCountyOnline.com to see all properties in the MLS or find out what your home is worth. Posted in Cape Coral, Cape Coral Real Estate, Fort Myers, Fort Myers Beach, Fort Myers Real Estate, Southwest Florida Real Estate.Tagged Lee County, search the SW Florida mls, SW Florida Home Sellers, SW Florida Real Estate Shift.